Title Page – Alas, this book was rebound in that ever-exciting generic library binding, so I bypassed photographing it. Anyway, this is a Heritage reprint of the LEC 2-volume Fairy Tales by Hans Christian Andersen, and the delightful artwork of Fritz Kredel, an excellent fit, accompanies it. Kredel would be no stranger to fairy tale illustrations, as he did a collection of art for Grosset & Dunlap for a set of Grimm’s Tales (Arthur Szyk did the art for Andersen’s in that line, FYI) in 1945. His whimsical style works well here, if you ask me. Andersen’s words were translated by Jean Hersholt. 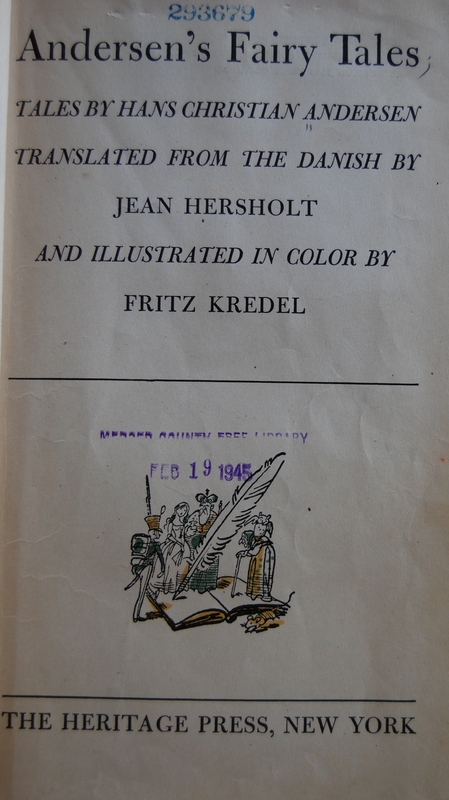 Both Kredel and Hersholt would sign the LEC edition, which is a little unusual. As I have no Sandglass, I’m in the dark on who designed this – please let me know if you have that information! Page 1 – I wonder if these were full color in the LEC – I’ve seen a few cases where the Heritage reprints have gone with a simpler color set for the illustrations, and seeing Kredel’s full color work in the Grimms’ book I have, I’m forced to ponder that possibility. Regardless of that tangent, Kredel’s work suits the kooky worlds and inhabitants of Andersen’s tales. Page 5 – Kredel also did in-text bits. I particularly like this one. Personal Notes – Having a set of Grimm’s Fairy Tales done by the Heritage Press, I’d like to have this book, too. As for now, I’ll remember the good days of checking this out from the library system. Any and all info on this book’s design process would be very useful! If you have a Sandglass or LEC Newsletter, please drop me a line here or through the comments at my thread about this blog at the George Macy Devotees @ LibraryThing! Thanks! I thought you may be interested. Today at an auction I purchased a set of Andersen’s books. The book you have highlighted above is included in the set of 3. 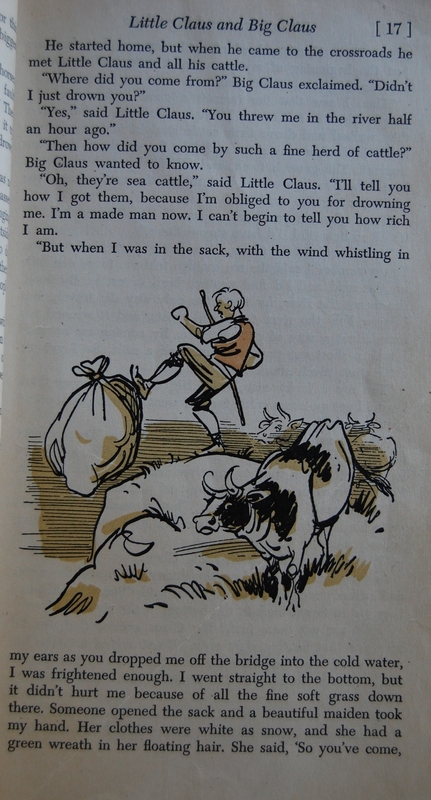 The first one is Andersen’s Fairy Tales published in 1942. 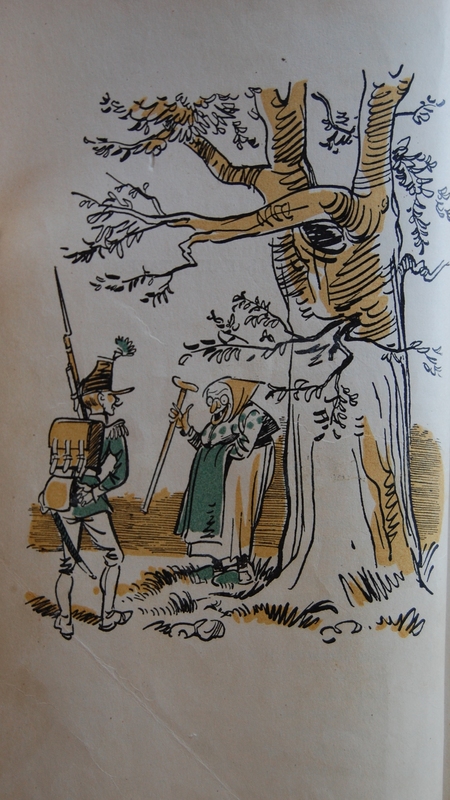 Then there is Andersen’s Shorter Tales published in 1948 and then Andersen’s Longer Stories also published in 1948.They are all illustrated by Fritz Kredel and translated by Jean Heresholt and all are published by the Limited Edition Club. All three books are in excellent condition. They are enclosed in a red binder that is in fair shape. I am not really a collector of old books but thought these were pretty neat. If you are interested you can email me. Sorry, but I don’t purchase books through this blog. Thanks for the offer, though. P.S. – I removed your e-mail from the comment to prevent any spam to head your way. 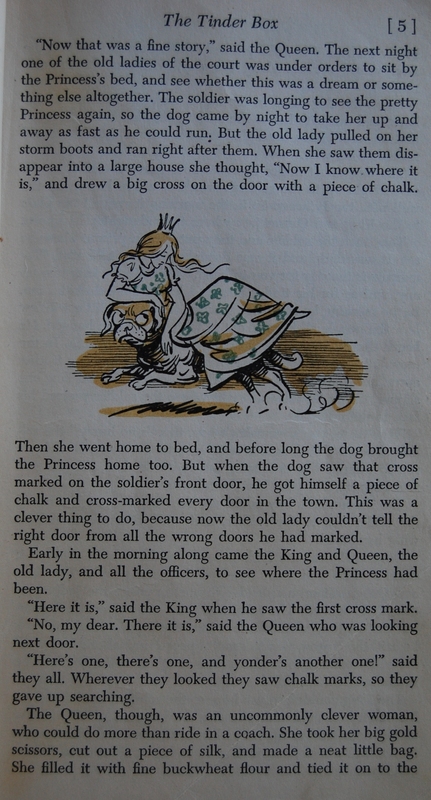 You are currently reading Heritage Press: Andersen’s Fairy Tales (1942) at The George Macy Imagery.